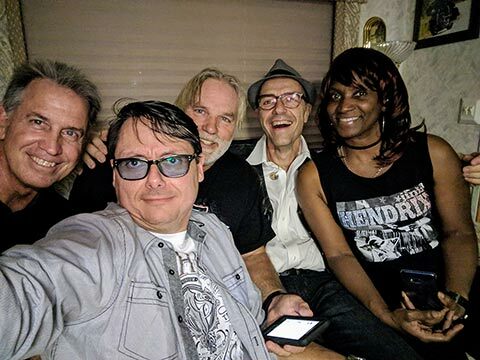 Bring on the Benjamins is a five-piece Rock Band from Pensacola, comprised of experienced musicians playing inspired Rock and Roll from the ‘70’s to today. Leading the band in bringing the party is Paul Glisson on vocals, guitar, keyboards and crowd encouragement. Pairing up with him on the lead vocals is Pearl Ash, whose wide-ranging singing talents are sure to blow you away; the chemistry between these two vocalists adds to the entertainment experience. Jim Faxlanger provides guitar finesse, ranging from solid rhythm backing to blistering solos. Supplying the rock-solid foundation of the sound and getting the feet on the dance floor is the rhythm section of Steve Saunders on drums and Jim Nielsen on bass. Everyone does backing vocals, leading to some tight, soaring harmonies; you can be sure to have a rocking good time at a Bring On The Benjamins show. Bring On The Benjamins- You’ll be glad you did! Bring On The Benjamins will be playing at Bands on the Beach on Tuesday, October 2 from 7-9 p.m. at the Gulfside Pavilion.